Have a Thirst for Knowledge? Introducing the Drinkable Book | Source: InnovateDevelopment.org, June 11, 2014. An estimated 3.4 million people die annually from preventable water-borne diseases, and many aren’t aware that their drinking water is contaminated. Water filter technology has come a long way in recent years, but most options are still restrictively expensive for use in the Global South or unsuitable for mass distribution. Enter the Drinkable Book. Developed by chemist Dr. Thersa Dankovick of the University of Virginia and McGill University, the drinkable book seeks to provide both cheap, clean drinking water and information on healthy sanitation practices. After ad agency DDB heard about Dr. Dankovich’s project and put her in touch with another of their clients, the NGO Water is Life. 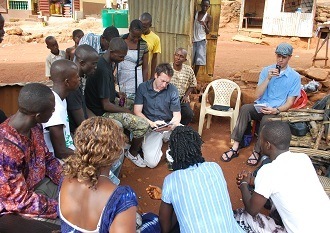 Together they developed the final product and are working to distribute the book through their programs. According to NPR, Dr. Dankovich tested the product in South Africa in 2013 and is planning further field trials in Ghana later in 2014. Crucially, the book costs just pennies to produce, making it far cheaper than alternative systems. Each page provides an individual with clean water for a month, and a book can last over a year. It filters over 99.9% of bacteria, making it as clean as tap water in the United States. It filters out cholera, typhoid, and e. coli, as well as larger pollutants and debris. The pages are about a millimeter thick and work like a high-tech coffee filter using silver nanoparticles. Silver causes interacting microbes to die, but has very little effect on people. Using the book is easy: simply tear our a perforated page, slide it into the included case, and pour contaminated water through it. With no other steps, the water is ready to drink safely. The silver turns the paper a burnt orange, making it eye-catching and distinct from other books. Information is printed on each page explaining safe water habits, like keeping trash and feces away from water sources and the benefits of regular hand washing. The information is currently being printed in English and Swahili using non-toxic food-grade ink. Using English and Swahili is a great step in accessibility, however it does restrict illiterate users or those who speak other languages or dialects. Hopefully as the project gains traction other languages can be incorporated, including Braille and non-verbal graphical systems. It is currently unclear how users know when each page is past its usefulness, though hopefully this will be incorporated into future designs. The book is also not suited for emergency or conflict zones that may require residents to move often. The soft material makes susceptible to wear and damage, and it is bulky to carry. However, Water is Life also uses an amazing straw that picks up where the drinkable book leaves off. For more information on the book and how to provide one for a community in need, check out the Water is Life website (specifically the blog) or this article from NPR.